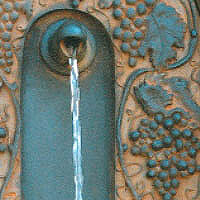 The pump for your fountain is at the bottom of the basin. It circulates water up through a hose on the back and out through the spout back into the basin. 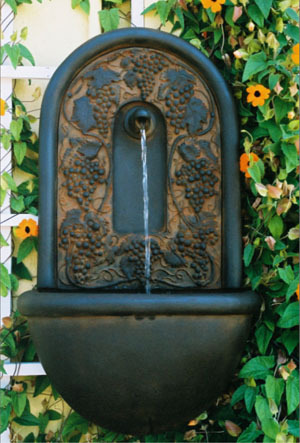 Each wall fountain comes with a choice of an electrical or a solar powered pump. The advantage of the electrical pump is that it runs independent of weather conditions. With the solar pump you do not need an electrical outlet nearby, making it easier to install outdoors in a garden. The solar pump model I offer holds a charge and keeps running for one to two hours even when it is overcast or at night time. The small solar panel is attached to the pump by a 15' cord which allows for flexible placement in order to get maximum exposure. You can modulate the sound of the running water by placing different types of materials into the basin such as a sponge, or small rocks. Each fountain comes with a pamphlet describing how to set it up, which is easy and uncomplicated, and includes more information about the pump. This fountain is custom made. Please allow 2 to 3 weeks for delivery. 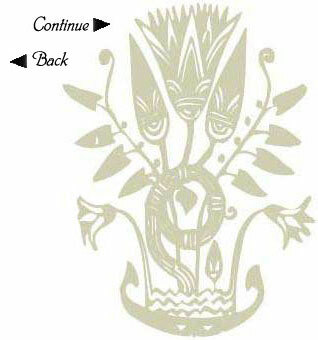 All artwork shown on this site is the sole property of the artist. without obtaining prior permission from Sigrid Herr.